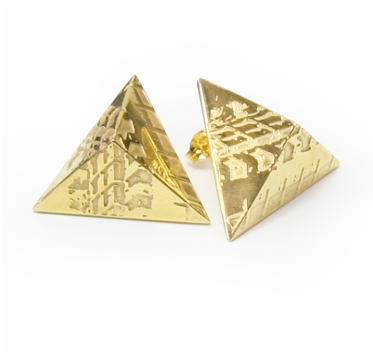 Sara Gunn creates bold and distinctive fashion jewellery in leather and metals. 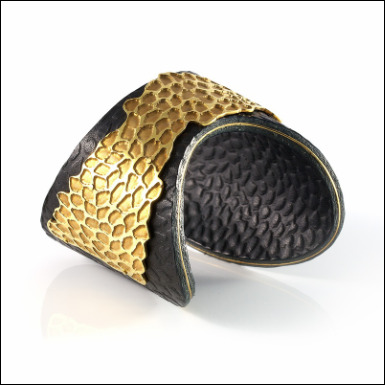 Rich textures adorn elegant, curvaceous leather cuffs and angular rings alike. 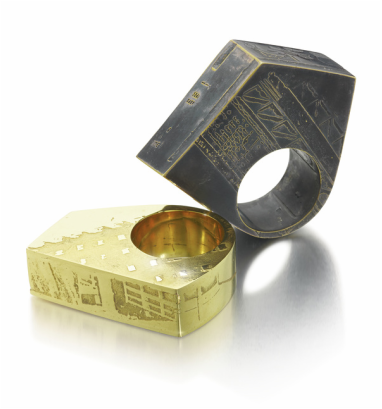 Her belief that that jewellery should be as individual as the wearer has led her to explore organic processes such as acid etching, which ensure a high degree of variation. Sources of inspiration range from the urban landscape and gritty London streets to microscopic details within the body. Each piece of jewellery is hand made by Sara in her London workshop in limited production runs, many pieces are one-off. Sara aims to create unique, covetable pieces that are a pleasure to wear. Sara’s ‘Skin’ and ‘Souvenir’ collections have been well received by the press, appearing in the FT How To Spend It Gift Guide, Daily Mail, Marie Claire, Hedonist, Fault, and worn by Charli XCX for Under the Radar Magazine. Winner of the 2013 Cockpit Arts Clear Insurance Award Sara is now based at Cockpit Arts in Holborn.